Student protests that are associated with disruption of teaching activities occur sporadically in many countries. Such events usually have a negative impact on teaching and learning, but also provide the impetus for experimentation and renewal of practices. During the student led protest movement #FeesMustFall in South Africa in 2016, three campuses of the University of Pretoria were closed for normal activities for an extended period and most teaching activities went online almost overnight. This study reports on insights gained about the affordances and weaknesses of the online learning environment using self-report data from both lecturers and students. A thematic approach was used to analyse the lecturers’ reflections on challenges faced and lessons learnt. The findings exemplify the resilience of lecturers as they embraced blended learning and their willingness to experiment and improve their practice. A mixed-methods approach was used to explore the student experience of the blended learning offering of first-year organic chemistry. The sample was stratified based on prior performance to uncover possible differences between subgroups. The pre- and post-chemistry e-learning surveys, comprising open and structured response questions, were completed by 1166 and 565 respondents, respectively. Inductive analysis of free response data generated themes on the student experience. A negative correlation was found between preference for online learning and performance, which is a reason for concern. 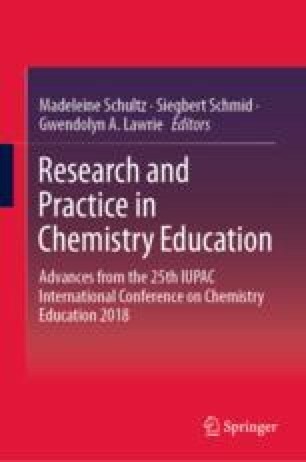 The results offer useful pointers for instructional design of blended organic chemistry courses, but they also raise questions about equity and students’ metacognitive awareness in a virtual learning environment. We acknowledge an allocation from a DHET Teaching Development Grant for a SOTL project. Responses to seven items in the pre-survey were coded as indicated below. The sample was divided into three groups of roughly equal size (high, medium and low) based on their scores for OL preference. If you have used Connect platform previously, rate how well it assisted you to master the course(s) (e.g. MLB or PHY). If you have used Learnsmart previously, rate how well it assisted you to master the course. If there is something you do not understand in class, how do you prefer to get additional information? Which type of compulsory tutorial do you think would help you understand the course better? Which type of compulsory tutorial do you think you would enjoy more? Do you prefer to read from a (i) paper-based book; (ii) e-book? Acton, T., Scott, M., & Hill, S. (2005). E-education-keys to success for organizations. In 18th Bled eConference eIntegration in action. Sloveni, 6–8 June. https://domino.fov.uni-mb.si/proceedings.nsf/0/b2f6ff8014823eabc1257014004916dc/$file/12acton.pdf. Accessed 3 August, 2017. Adams Becker, S., Cummins, M., Davis, A., Freeman, A., Hall Giesinger, C., & Ananthanarayanan, V. (2017). NMC horizon report: 2017 Higher Education Edition. https://www.sconul.ac.uk/sites/default/files/documents/2017-nmc-horizon-report-he-EN.pdf. Accessed 7 August, 2017. Brooks, R. (2016). Politics and protest—students rise up worldwide. University World News, 13,413. http://www.universityworldnews.com. Accessed 25 September, 2017. Hill, T., Chidambaram, L., & Summers, J. (2013). A field experiment in blended learning. Performance effects of supplementing traditional classroom experience with web-based virtual learning environment. In 13th AMCIS Proceedings 15–17 August 2013. https://aisel.aisnet.org/amcis2013/ISEducation/GeneralPresentations/5. Accessed 1 August, 2017. Isilow, H. (2016, October 5). South Africa university shuts for week after protests. http://aa.com.tr/en/africa/south-africa-university-shuts-for-week-after-protests/658825. Accessed 14 June, 2017. Lewis, S. (2016, June 8). Papua New Guinea moves to end student protests after violence. Time, Available at: www.time.com. Accessed 25 September, 2017. Marin, M. (2012, April 22). Student protestors in Quebec are safeguarding the future. University World News. www.universityworldnews.com. Accessed 25 September, 2017. Ossiannilson, E. (2017). Blended learning: State of the Nation. https://icde.memberclicks.net/assets/RESOURCES/BlendedLearningICDEInsightPaper2017compressed.pdf. Accessed 6 September, 2018. Renner, D., Laumer, S., & Weitzel, T. (2014). Effectiveness and efficiency of blended learning: A literature review. In 20th Americas conference on information systems proceedings 7–9 August 2014. https://aisel.aisnet.org/cgi/viewcontent.cgi?article=1286&context=amcis2014. Accessed 11 August, 2017.